U3A clubs on the Gold Coast. The topics are varied but always interesting. At the first lecture on 29 March we will be hearing from Professor Catherine Pickering. I understand that the lecture will also included a small walk outside the Chancellery building to point out some rare and threatened plant species. Professor Catherine Pickering is a botanist with a passion for native plants. She has over 30 years’ experiences in plant ecology, conservation, climate change and park management, with 230 publications. For those who have not attended before, the best way to get to the lecture is by tram. 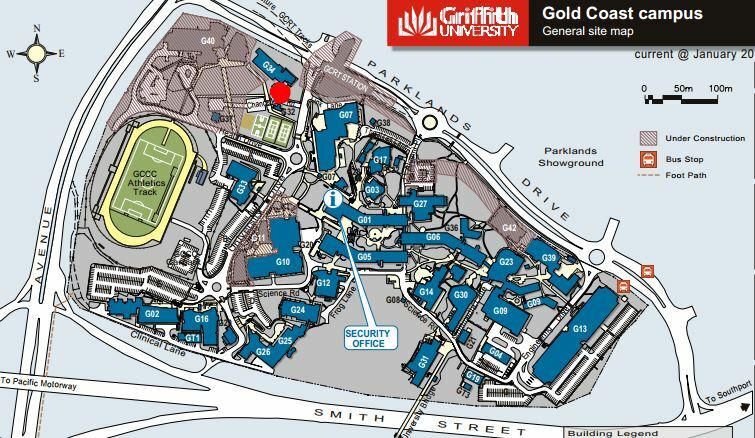 Alight at the Gold Coast University Hospital stop, exit to the left (by lift or stairs) and G34 building is close by. The lecture room is on the ground floor. If coming by car check the university website for parking options. Although the schedule says the lecture starts at 2.15pm they sometimes start a little early so try and be there by 2pm. catch the tram to the terminus at Gold Coast University Hospital. Take the escalator to street level and cross at the traffic lights to enter the University precinct. Marked with a red dot on the map below.